ST. JOHN’S, Antigua (AP) — The most powerful Atlantic Ocean hurricane in recorded history bore down on the islands of the northeast Caribbean late Tuesday, following a path predicted to then rake Puerto Rico, the Dominican Republic, Haiti and Cuba before possibly heading for Florida over the weekend. The Category 5 storm had maximum sustained winds of 185 mph (295 kph), according to the U.S. National Hurricane Center in Miami. U.S. President Donald Trump declared emergencies in Florida, Puerto Rico and the U.S. Virgin Islands, and authorities in the Bahamas said they would evacuate the residents of six islands at the southern end of the island chain. Four other storms have had winds as strong in the overall Atlantic region but they were in the Caribbean Sea or the Gulf of Mexico, which are usually home to warmer waters that fuel cyclones. Hurricane Allen hit 190 mph in 1980, while 2005′s Wilma, 1988′s Gilbert and a 1935 great Florida Key storm all had 185 mph winds. 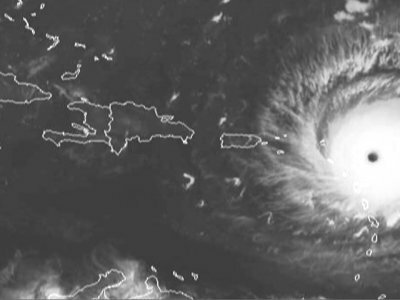 The storm’s eye was expected to pass about 50 miles (85 kilometers) from Puerto Rico late Wednesday. Hurricane-force winds extended outward up to 50 miles (85 kilometers) from Irma’s center and tropical storm-force winds extended outward up to 175 miles (280 kilometers). A new tropical storm also formed in the Atlantic on Tuesday, to the east of Irma. The hurricane center said Tropical Storm Jose was about 1,330 miles (2,140 kilometers) east of the Lesser Antilles late Tuesday and its maximum sustained winds had risen to 50 mph (85 kph). It was moving west-northwest at 14 mph (22 kph) and could become a hurricane by Wednesday night. Associated Press writer Anita Kentish reported this story in Antigua and AP writer Danica Coto reported from San Juan, Puerto Rico. AP writers Seth Borenstein in Washington, Michael Weissenstein in Havana, Cuba and Ben Fox in Miami contributed to this report.